I was born in Aosta on November 8th, 1979 and I now live in Champoluc (Val d’Ayas) while working as a ski instructor and mountain guide. I first started skiing when at the age of 3 with my father who was an alpine skiing instructor. 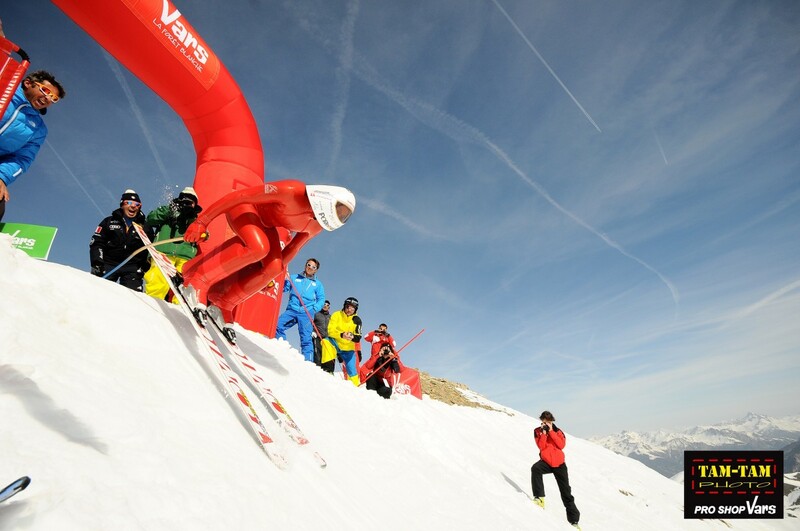 I became a member of the Val d’Ayas ski club and Cervinia ski club. 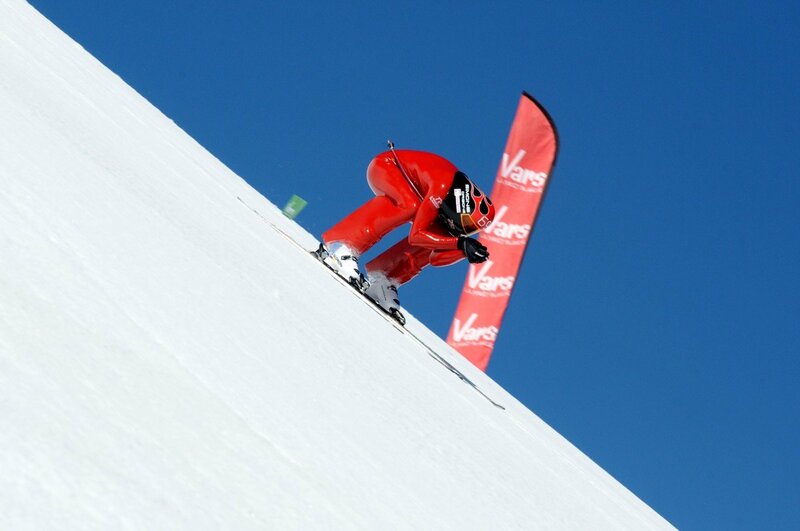 At the age of 16, I became a part of the Aosta Valley Committee for the speed ski discipline. Bruno Seletto was my trainer and he passed me on his the passion for speed skiing and taught me how to train as a professional athlete. When I was 19, I became member of the secondary sport team of the Italian Army, but after six months I was discharged due to a health problem. 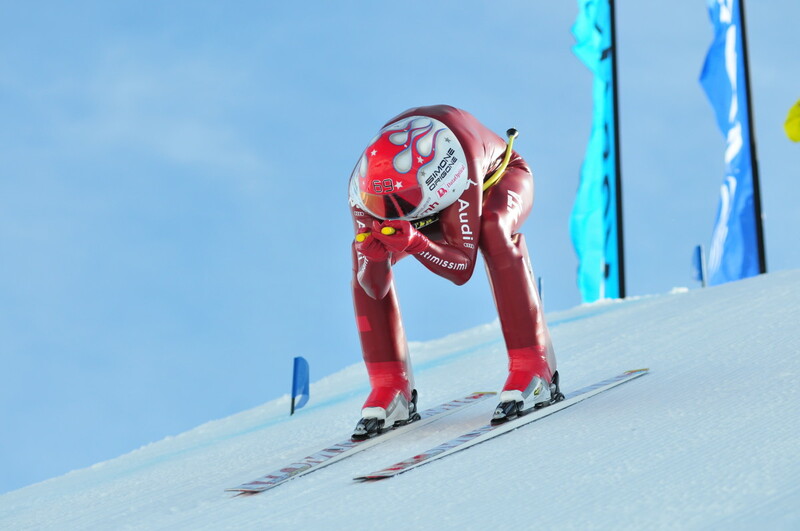 So, after the 1998/1999 season, I decided to retire from racing alpine skiing. In 2003 I visited with a friend the famous Olympic track of Les Arcs 2000 in France to try a workout in Speed Ski on. 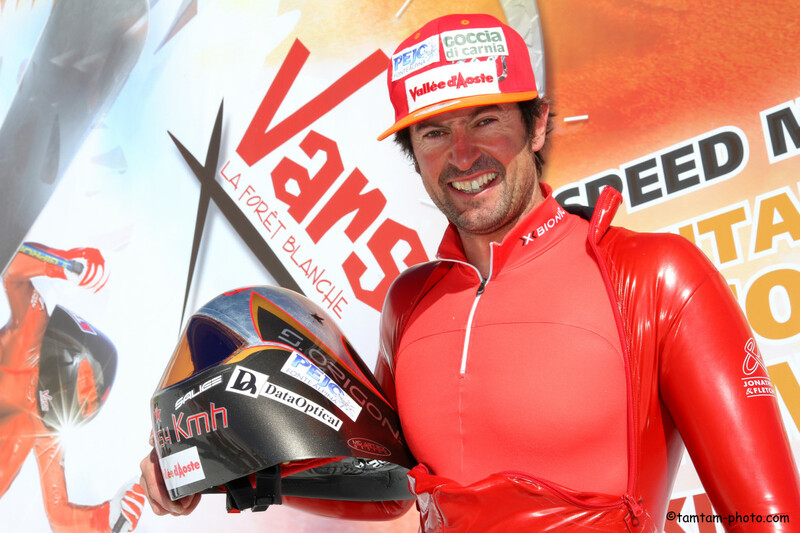 On April 2006 I established at the same spot, my first speed ski record: 251.400 km/h. In this very workout by using downhill materials, I reached a speed of 179 km/h. After this success, I signed up for the first race that I won by reaching a speed of 200.89 km/. Thanks to the great results I achieved in 2004, I was invited to join the Italian speed ski national team and my career got off the ground. Starting from that point and on, I have gained a lot of satisfaction and good results as well as difficult times because of injuries and a couple of nasty falls. Anyway, the desire to continue to run and try to go faster and faster and beat new records, is always deep-rooted in me. 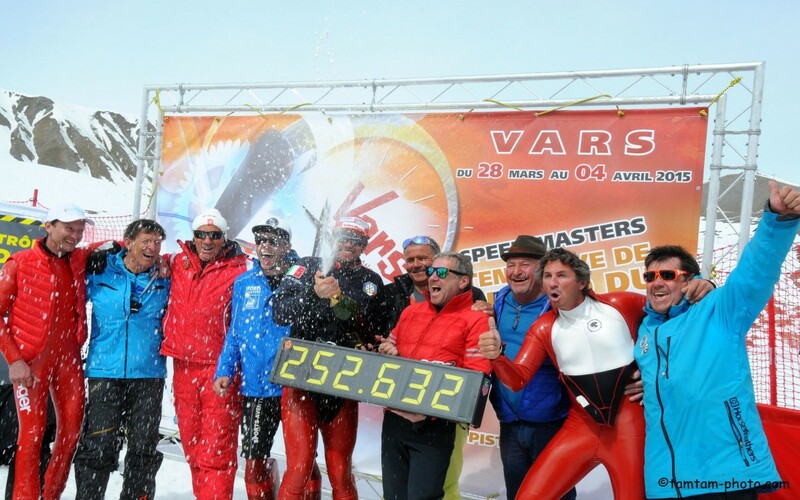 On the 31st of March 2014, I established the second world record in my career: 252.454 km/h in Vars (France). So I’m the fastest man in the world (non motorized)! 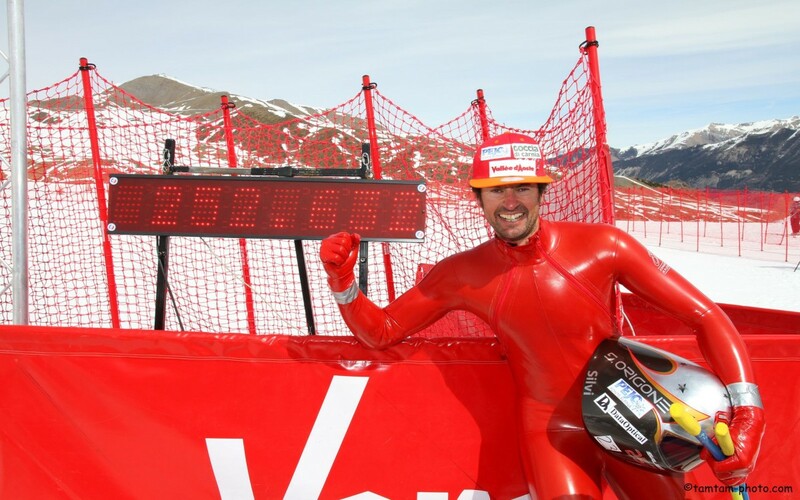 The next year on the same track, I improved my record for the third time taking it to 252.632 km / h.
During my speed ski activity I also moved for a while into climbing among the Valle d’Aosta mountains. In 2007, I visited Monte Rosa and Matterhorn range and climbed all the peaks above 4000mt (21 peaks above 4000mt). In summer 2009, I attempted to conquer the peaks of Mont Blanc, the Matterhorn and Monte Rosa in 24 hours, by bike: unfortunately, after 17 hours on the Matterhorn I stopped at three-quarters of this challenge because of a strong pain in my knees. Since then I decided to dedicate myself to speed skiing and set aside these summer activities. However, in the summer 2014 I participated to an expedition on the K2 organized by Agostino Da Polenza that was called “K2 – 60 years later”. In this moment I have to recover from a surgery on my knee and for the next winter I’m looking for a new world record. My greatest achievement would be to reach 255 km/h. There are many difficulties but the most important thing is trying to maintain the best aerodynamic position during the race, with high speed is very difficult. The biggest satisfaction is to be the fastest man on earth. Sometimes I train alone, sometimes with my brother and sometimes with the Italian team (gym and on the snow). 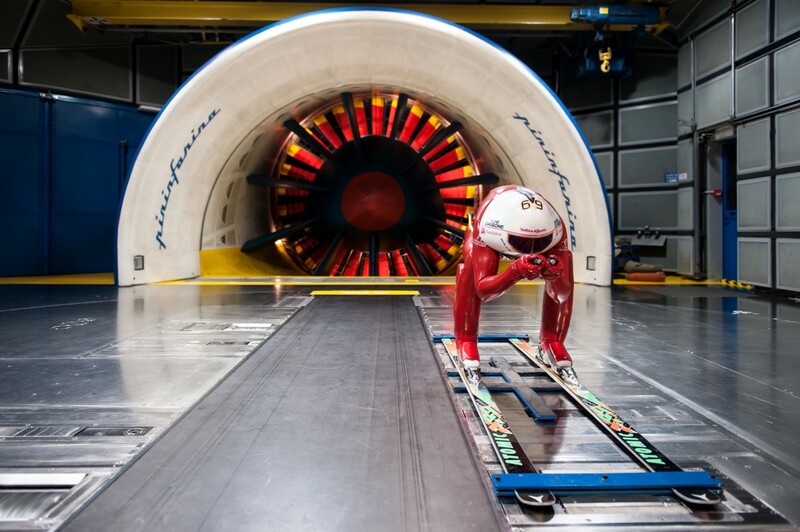 I also do wind tunnel tests. The key of my success is to try to push always over my limits. I think that my father is my biggest fan because he has been a ski trainer for many years and he is a passionate of winter sports. The best piece of advice is that you have to work hard to follow your dreams. My future plans are to carry on racing at high level and to go back to climb the K2 where I’ve been in 2014. 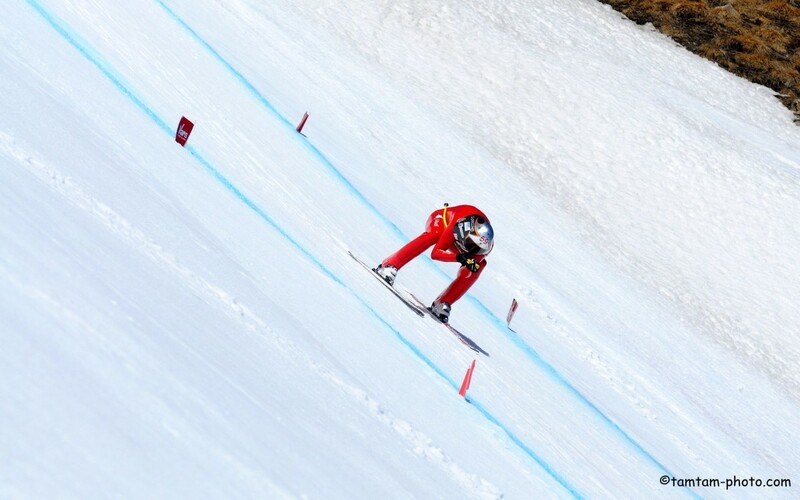 My tip for the beginners is to have a very good technique achieved during alpine ski races.